Nelson A. Koeman, age 97, of Vriesland died Wednesday, October 25, 2017 at Sheldon Meadows Assisted Living in Hudsonville. Nelson was a veteran of WWII serving in the US Army and was in the Michigan National Guard, Holland Unit, for 12 years. He was an active member of the VFW 2144 in Holland, a member of the DAV and the American Legion. Nelson was a national Chaplin for the VFW. 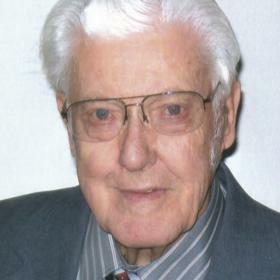 He was a member of Vriesland Reformed Church from 1947 – 2000 and currently a member of the Beaverdam Reformed Church where he served as an elder. Nelson was a dairy farmer in Vriesland from 1947 – 1975. He loved being around draft horses and after he retired he enjoyed going to work with his sons on the farm. He was preceded in death by his first wife Marge Koeman in 1990, his son’s Alan Koeman in 1977 and Dennis Koeman in 2008, daughter-in-law Mary Koeman in 2007 and stepson William De Boer in 1996. He is survived by his wife Bernice and children: Fran and Ted Kempkers of Drenthe, Brian and Jan Koeman of Hudsonville, Craig and Candi Koeman of Borculo, Evan and Karen Koeman of Hudsonville and Gerry and Brenda Koeman of Borculo; 14 grandchildren; 23 great grandchildren; brother: Marvin Koeman of Holland; sister: Esther Nelson of Richmond, VA; step children:Robert and Marcia De Boer of Georgetown Twp., MI, Jack and Diane De Boer of Beaverdam and Arloa and David Schout of Dorr; many nieces, nephews and cousins. A funeral service will be held at 10:00 am, Saturday, October 28 at Vriesland Reformed Church, 6839 Byron Road in Vriesland. Chaplain Scott Koeman will be officiating. Burial will be in Vriesland cemetery.